The advent of salmon farming in the late 1980’s in Ireland gave rise to much debate in regard to the negative effects that this new type of practice might mean for our coastal marine environment. Unfortunately the most visible consequence was observed almost immediately in that a strange and unexpected premature sea trout migration back to freshwater took place in areas where salmon farming was being carried out. These fish were early returnees and within a few weeks of their migration as smolts or kelts they had returned in large numbers with varying degrees of injury and infection. 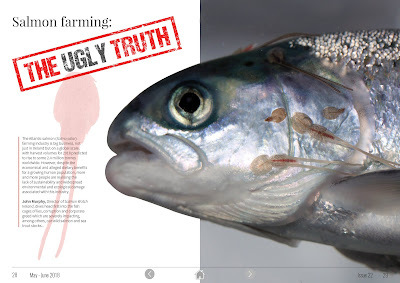 Adults and finnock (immature fish at sea) were equally affected with the common denominator being their closeness to salmon farms and the number of sea lice attached to these wild fish,which were many times what was expected in wild fish. Please click on link to view the full article.